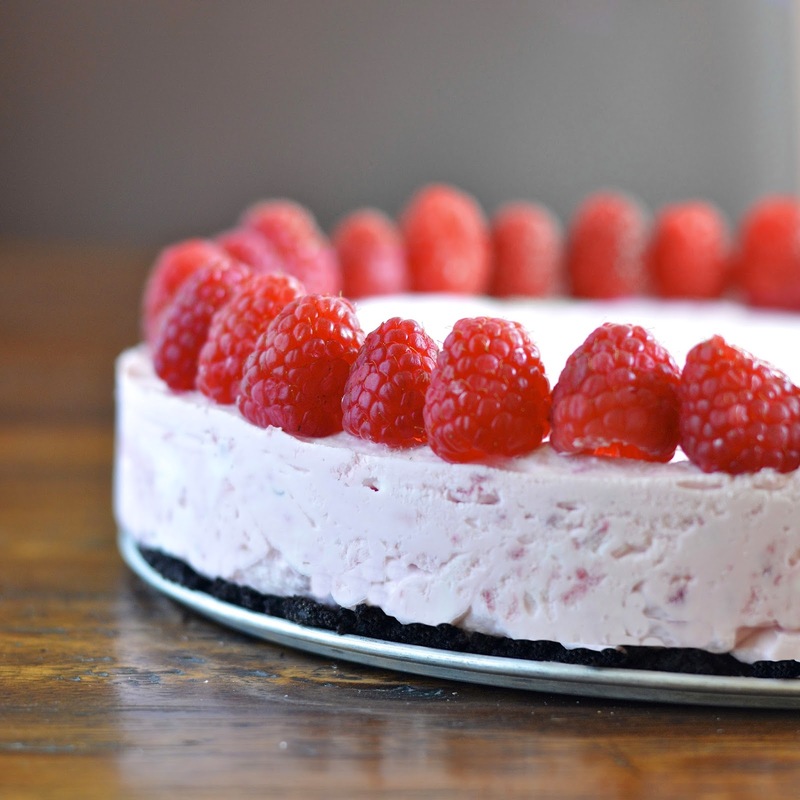 Frozen Raspberry Cheesecake is an easy and great dessert for the warm months to come. 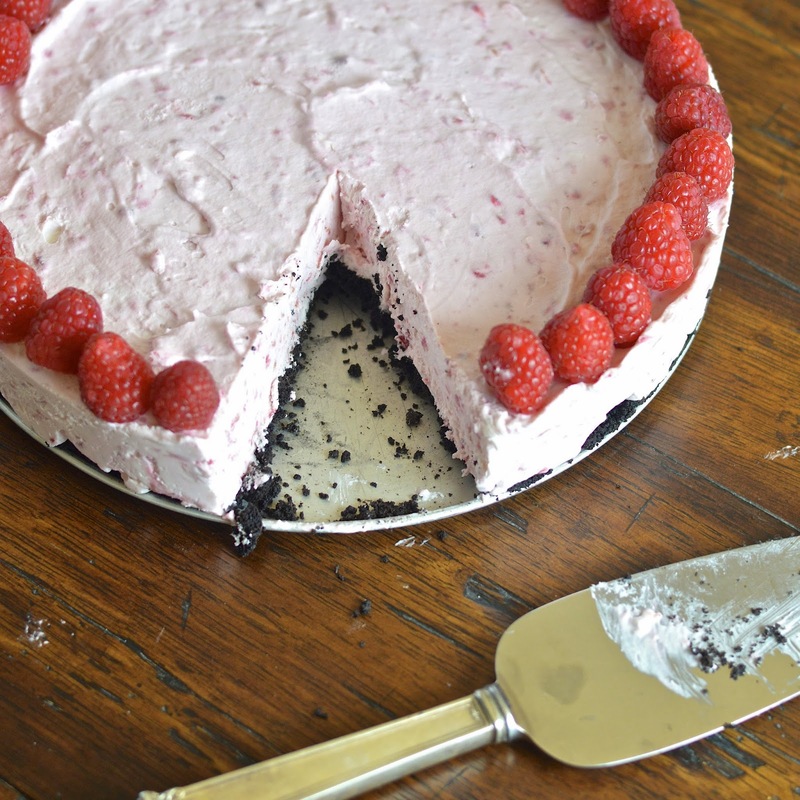 This frozen raspberry cheesecake is the perfect dessert for warm spring and summer evenings. And let me tell you, it is HOT in San Diego right now. I couldn’t have timed this raspberry cheesecake any better. The cool creaminess of the cake was like a blessing yesterday when the temperature hit 95 degrees and the Santa Anna winds ominously swept through the palms trees and backyards (I am not even going to talk about the wildfires about 8 miles from my home). After sweating through my photo session, my kids and I sat down and let this frozen raspberry cheesecake cool and soothe our hot bodies. Then we hauled up in my son’s room where we had a portable air conditioner! I also can’t express how easy this cheesecake is to prepare. 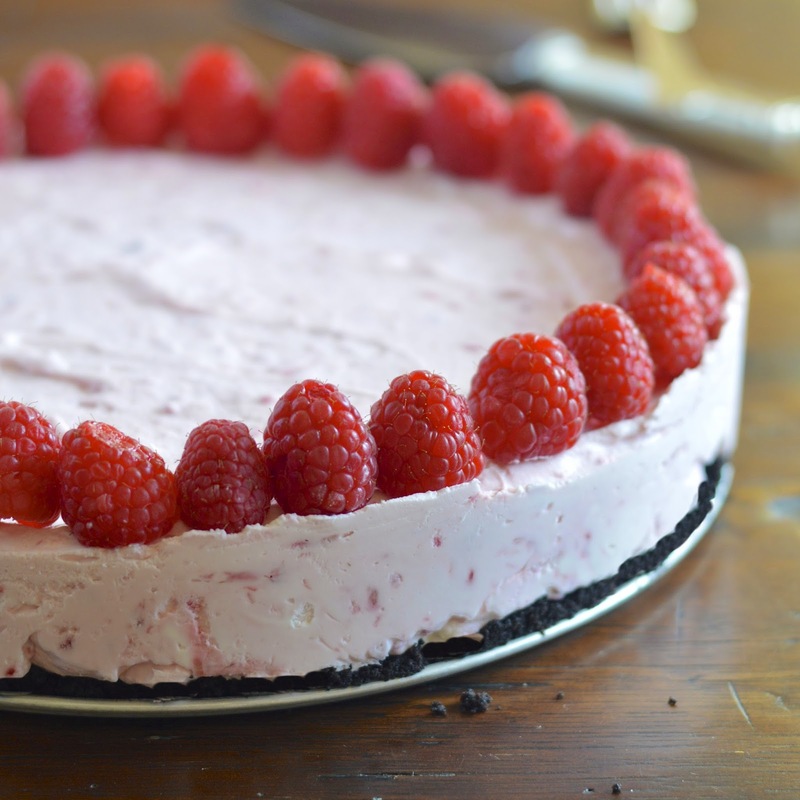 It basically consists of 5 ingredients – raspberries, cream cheese, cream, sugar and chocolate wafers (there’s a little butter and lemon too). Who knew you could enjoy such a decadent dessert without turning on the oven? Oh yeah, then I spent most of the night picking frozen raspberries off the cheesecake as a snack. I am now officially addicted to frozen raspberries and I’m pretty sure they lowered my body temp by 10 degrees! In a small bowl, combine chocolate crumbs and butter. Press crumb mixture into the bottom of a 9 inch springform pan. In a large bowl beat cream cheese and powdered sugar until well combined and smooth. Add raspberries and lemon juice. Beat until well combined. Fold in whipped cream. Pour mixture onto crust and even out the top. Place in freezer and freeze for 3 to 4 hours or overnight. Remove rim and garnish with fresh raspberries if desired.